Boosters of the sport want the University of Washington to have an Olympic log-rolling team, eventually. Log rolling is also a good workout. It looked like it might be easy. 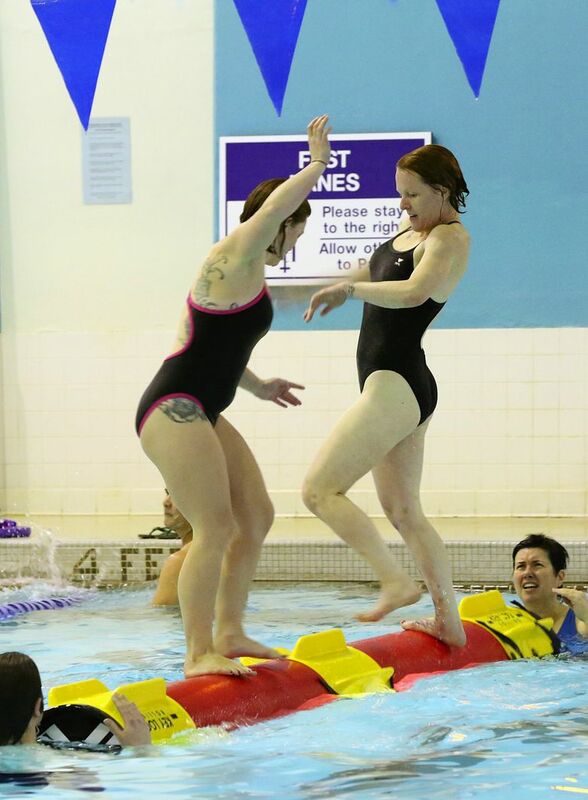 The brightly colored, large tube was floating so harmlessly, playfully almost, in the pool at the University of Washington’s Intramural Activities Building, that it practially begged people to step out and try it. 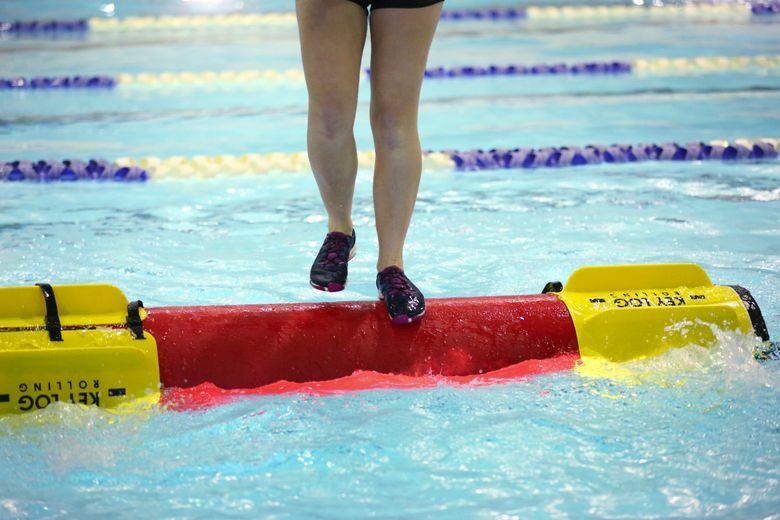 And that’s just what a group of fitness instructors and a UW aquatics director did over the weekend when the Key Logs — portable, synthetic “logs” created by a family of champion log rollers — were first slipped into the pool. 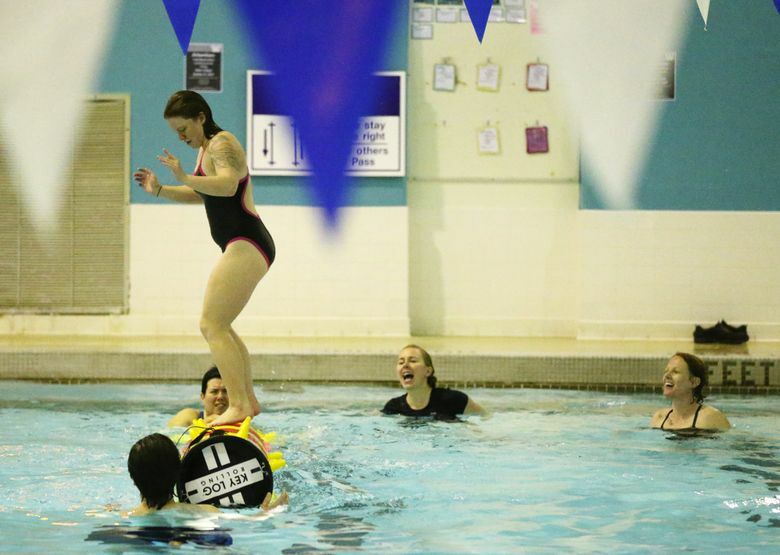 The UW bought four Key Logs as part of the recreation department’s efforts to get nontraditional athletes involved in physical activities, according to aquatics and safety manager Justin Berry. 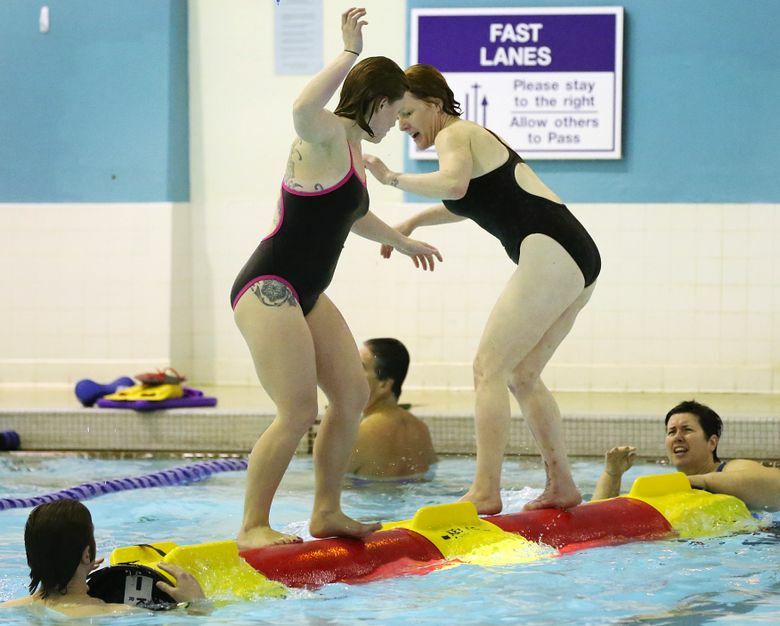 The UW is joining about 400 other clubs, summer camps, universities, military training facilities and fitness centers in seven countries that have over the past few years either created a log-rolling team or are teaching the sport as a fitness activity. 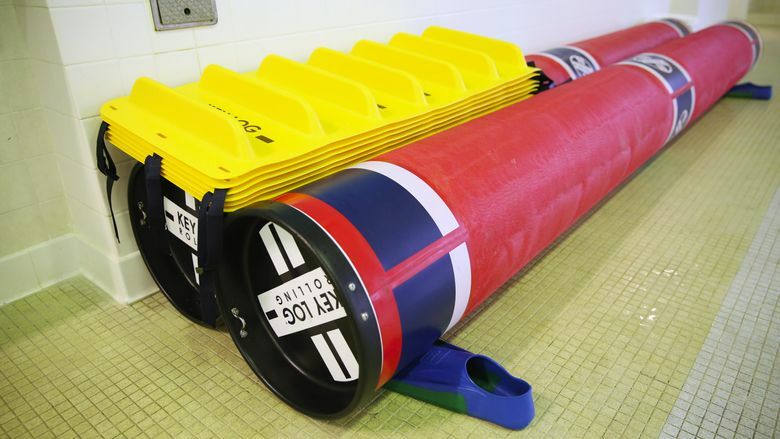 UW students and faculty will have a chance to try log rolling at the intramural pool when classes are held from 6 to 7:30 p.m. on Jan. 27, Feb. 3 and 10. If there’s enough interest, said instructor Sarah Beron, the school will hold competitions and begin building a team. Log rolling isn’t foreign to the UW. Photos show students in 1957 and 1964 participating in contests. The sport began during the great lumber drives of the late 1800s, when thousands of logs were felled and sent to mills downriver. But the logs jammed, and lumber companies took to hiring people to step on the logs and keep them moving. In time, it became a competition to see who could outlast the others on the spinning logs. According to Abby Hoeschler, a log-rolling champion and the president of Key Log Rolling, soon lumber companies and other entrepreneurs were sponsoring log rolling contests. Competitions these days take place between two people who are both on one log, trying to knock the other off without using their hands. It was popular enough to have been featured on ABC’s Wide World of Sports and to draw crowds at events such as the Lumberjack World Championships in Hayward. Wis., and the Loggerodeo in Sedro-Woolley. However, the Hoeschlers realized the sport could never grow as long as it depended on the traditional lathed, wooden logs. At 500 pounds each, they were not easily transported or stored. Five years ago, Hoeschler’s Minnesota-based family company produced the first portable, synthetic Key Logs. When filled with water, the man-made logs, costing $2,150, have the buoyancy of the best log-rolling wood, the Western red cedar. And when empty, they weigh only 65 pounds. In addition, the company added on three “trainers,” which slow the log’s spin and act like a training wheel. Hoeschler and her family say they’d love to see log rolling become an Olympic sport. The sport works the heart and lungs, is easy on the joints, promotes balance and is almost injury free, Hoeschler said. It’s those health benefits that had the team from Anacortes at the pool. “It’s good for balance, which is one of the things people need to work on as they age and it forces you to train in a safe way,” said personal trainer Meagan Zielinski. Because it’s a relatively rare sport, it’s not easy to find opportunities for the casually curious — unless they live in Anacortes or go to the UW — to try out the logs. However, Hoeschler said she expects that to change in time. Berry, the UW aquatics director, was able to stay on the log for about 15 seconds by the time his first lesson ended. He said success requires the kind of focus you need for surfing, skateboarding and snowboarding, with the added requirement of constant motion.